И кто к кому относится. Сохраню и тут, чтобы не забыть. 1st Brigade: Badr. An affiliate called Liwa al-Imam Muhammad al-Jawad. 2nd Brigade: Imam Ali Combat Division. It is affiliated with the Imam Ali shrine in Najaf. 3rd Brigade: Badr: Tashkil Asad Amerli. 5th Brigade: Badr. The Tashkil al-Karar unit. Notable because its former commander- Abu Dergham al-Maturi- is now deputy commander of the Interior Ministry-affiliated federal police. Note that he was also in the federal police during his time as commander of Badr's 5th Brigade. 6th Brigade: Kata'ib Jund al-Imam (affiliated with the Iranian-aligned 'Islamic Movement in Iraq', set up in 1991). The leader Ahmad al-Asadi is a spokesman for the Hashd Sha'abi Commission. 7th Brigade: Liwa al-Muntadhar, led by Dagher al-Mousawi. Originally part of the Iranian-aligned Jihad and Development Movement that was a part of the Islamic Supreme Council of Iraq (ISCI) umbrella. Liwa al-Muntadhar has formally split off from the Jihad and Development Movement. 8th Brigade: Saraya Ashura'. A militia affiliated with Ammar al-Hakim, who led ISCI. He has evolved into more of a nationalist figure over time and set up his own political movement for the upcoming parliamentary elections in 2018. 9th Brigade: Liwa Karbala'. Affiliated with Badr. 11th Brigade: Liwa Ali al-Akbar. Affiliated with the Imam Hussein shrine in Karbala'. 12th Brigade: Harakat al-Nujaba', an Iranian-aligned group that has been very vocal about its deployments to Syria. Its leader Akram al-Ka'abi was in Asa'ib Ahl al-Haq, which originated in the Sadrist movement, receives support from Iran and broadly aligns with Iran even as its leader Qais al-Khaz'ali does not necessarily identify with Iran's ideological governing system. 13th Brigade: Liwa al-Tafuf. Affiliated with the Imam Hussein shrine in Karbala'. The leader Qasim Muslih was originally in Liwa Ali al-Akbar. Despite Qasim Muslih's separation from Liwa Ali al-Akbar, both brigades are affiliated with the same shrine and are acknowledged by it. The matter is therefore an internal one for the shrine, rather than a case analogous to Sadrist splinters encouraged by Iran. Another line of interpretation claims a deliberate conspiracy by Iran acting through Abu Mahdi al-Mohandis to undermine Liwa Ali al-Akbar, though the account seems somewhat hyperbolic. 14th Brigade: Kata'ib Sayyid al-Shuhada'. Iranian-aligned group. Like Harakat al-Nujaba', it emerged in 2013 and is very vocal about its deployments to Syria. 15th Brigade: Quwat al-Shaheed al-Sadr (aka National Defence Brigades). Affiliated with the original Da'wa Party. Kata'ib al-Fatah al-Mubin, a lesser-known Iranian-aligned militia, appears to have had a commander in the ranks of this brigade. 17th Brigade: Saraya al-Jihad. Armed wing of the Jihad and Development Movement, which separated from ISCI and Ammar al-Hakim. The group has more recently deployed to Syria. 18th Brigade: Saraya al-Khorasani, an Iranian-aligned group with origins going back to the 1990s. First made more of a public impact through advertising its deployments to Syria on social media in 2013. 19th Brigade: Ansar Allah al-Awfiya' and Tashkil al-Hussein al-Tha'ir. The former is a clearly Iranian-aligned group that has openly advertised deploying to Syria. Within Iraq, the group has a notable affiliate in the west Anbar desert near the border with Syria (Quwat al-Buraq). Tashkil al-Hussein al-Tha'ir is best described as a Sadrist splinter. There are long-standing references to one of its leaders- Abd al-Zahra al-Swei'adi- as an associate of Muqtada al-Sadr in Baghdad. 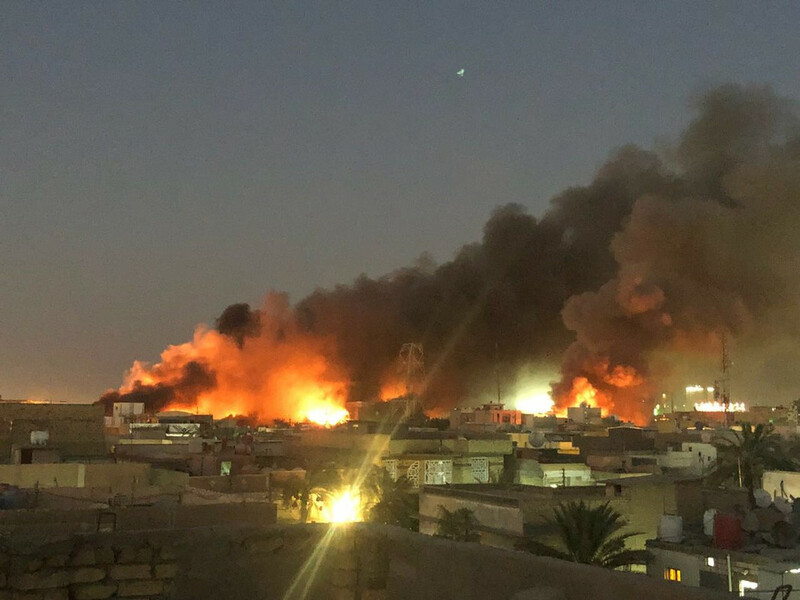 A query put in 2015 to Muqtada al-Sadr asserted that most of the group's members, from officials to ordinary rank-and-file personnel, were in Muqtada's Saraya al-Salam militia (the reconstituted Mahdi Army). In response, Sadr denied that the group is part of Saraya al-Salam. 20th Brigade: Liwa al-Taff. Its leader Hashim Ahmad al-Tamimi was originally in the al-Abbas Combat Division. According to a member of the formation, Liwa al-Taff is independent, though he did not profess to know the exact reason for the original split from the al-Abbas Combat Division. The matter thus differs somewhat from the formation of Liwa al-Tafuf, which is shrine-affiliated even as its commander was originally in Liwa Ali al-Akbar. In any case, this member of Liwa al-Taff did affirm that the leadership and fighters are Sistani-loyalists. Some social media output from Liwa al-Taff shows Abu Mahdi al-Mohandis meeting with the group and praising its efforts. 22nd Brigade: Badr, led by Abu Kawthar al-Muhammadawi, Badr official for Maysan province in the southeast of Iraq. 23rd Brigade: Badr. Unit primarily operating to maintain internal security in Diyala, whose current governor is affiliated with Badr. 24th Brigade: Badr. Unit primarily operating to maintain internal security in Diyala. 25th Brigade: Quwat al-Shaheed al-Sadr al-Awal. Appears to be linked to Nouri al-Maliki and his wing of the Da'wa Party, as illustrated by frequent embeds for Maliki's TV channel Afaq with the group. A deputy commander of this group- Ja'afar al-Banadawi (aka Abu Kawthar)- was involved in Kata'ib al-Imam Ali's efforts in Syria. 26th Brigade: al-Abbas Combat Division. Affiliated with the al-Abbas Shrine in Karbala'. The group has links with the Defence Ministry, with one of its regiments joining the ministry in July 2017. 27th Brigade: Badr: Quwat al-Shaheed al-Qa'id Abu Muntadhar al-Muhammadawi. 28th Brigade: Saraya Ansar al-'Aqeeda. Led by Jalal al-Din al-Saghir who has been part of the ISCI umbrella and became closer to Iran over time. First emerged as a force fighting in Syria. 29th Brigade: Kata'ib Ansar al-Hujja. Led by one Ahmad al-Fariji, who had previously fought against the U.S. occupation. The group is officially supposed to be independent but is close to Abu Mahdi al-Mohandis, according to its media spokesman. It should not be confused with the Kata'ib Ansar al-Hujja of Muhammad al-Kinani, which features in the list of groups condemned as fake Hashd. 30th Brigade: Liwa al-Shabak/Quwat Sahl Ninawa. Recruiting among the Shabak minority in the Ninawa plains. Linked to Badr despite claims of being independent. 31st Brigade: Risaliyun (Kata'ib al-Tayyar al-Risali). Sadrist splinter in origin (cf. here). The leader is Adnan al-Shahmani, an MP who ran for election in 2014 within the State of Law bloc and set up his own 'Sacrifice for the Resistance' bloc within the State of Law bloc in September of that year. Shahmani is close to Nouri al-Maliki and other Iranian-aligned figures such as Badr leader Hadi al-Amiri. 33rd Brigade: Quwat Wa'ad Allah (aka Liwa al-Shabab al-Risali). Linked to the Fadhila Party of the Sadrist trend. 35th Brigade: Quwat al-Shaheed al-Sadr, affiliated with the Da'wa Party- Iraq Organization, an Iranian-aligned splinter from the original Da'wa Party. 36th Brigade: Apparently, the Lalish Regiment, which has recruited Yezidis. The Lalish Regiment is tied to Liwa al-Hussein (53rd Brigade), which is a unit that recruited from Shi'a from Tel Afar and is affiliated with Badr. 39th Brigade: Harakat al-Abdal, an Iranian-aligned militia that is vocal about its efforts in Syria. Members of this group have formed another Iranian-aligned militia fighting in Syria: Kata'ib Safin. 40th Brigade: Kata'ib al-Imam Ali, affiliated with the Islamic Movement of Iraq (not to be confused with the Islamic Movement in Iraq associated with Kata'ib Jund al-Imam). Led by Shabal al-Zaidi, who was once a notorious Mahdi Army commander. The group is clearly aligned with Iran and has deployed to Syria. 41st Brigade: Asa'ib Ahl al-Haq. 42nd Brigade: Asa'ib Ahl al-Haq: Quwat/Liwa [al-Shaheed] al-Qa'id Abu Mousa al-Amiri. 43rd Brigade: Asa'ib Ahl al-Haq: Saba' al-Dujail. 44th Brigade: Liwa Ansar al-Marja'iyya. Led by Hamid al-Yasiri, who is a representative of Ayatollah Sistani in the southern province of al-Muthanna. 46th Brigade: Saraya al-Difa' al-Sha'abi, a Kata'ib Hezbollah affiliate. 47th Brigade: Saraya al-Difa' al-Sha'abi. As above. 50th Brigade: Kata'ib Babiliyun, led by Rayan al-Kaldani, a Chaldean Christian. The group has at least some Christian members and has been closely intertwined with Liwa al-Shabak/Quwat Sahl Ninawa. It is aligned with Iran politically. The brigade seems to be expanding recruitment among minorities, as news recently came that a Kaka'i unit is to be part of the brigade. In Ninawa, Kata'ib Babiliyun has been at odds with the Assyrian identity-oriented Ninawa Plain Protection Units, which is also supposed to be affiliated with the Hashd Sha'abi Commission. 51st Brigade: Salah al-Din Brigade. It is a Sunni Hashd unit based in the al-Shirqat area. The group has received support from Iran and is close to Abu Mahdi al-Mohandis. See this report for more details. 52nd Brigade: Badr's Fawj Amerli. A Turkmen unit led by Mahdi Taqi al-Amerli, a Badr member of the Salah al-Din provincial council. 53rd Brigade: Liwa al-Hussein (cf. entry on Fawj Lalish). Led by one Mukhtar al-Musawi and affiliated with Badr. 55th Brigade: Badr: Tashkil Malik al-Ashtar. 56th Brigade: Kirkuk Hashd/Hawija area (aka Liwa Hashd Shuhada' Kirkuk). A Sunni Hashd group led by one Hussein Ali Najm al-Juburi, who has a Sunni Sahwa background. The initial foundations of the 56th brigade trace back to efforts by Falah al-Fayyad and the Union of National Forces Party MP Muhammad Tamim. It appears that there are friendly relations between the 56th Brigade and the Kirkuk Hashd groups affiliated with Quwat Ahrar al-Iraq, which was set up in June 2014 as the military wing of the Iraqi Dar al-'Ifta' under Mahdi al-Sumaida'i, a Sunni cleric who has been associated with support for the government for a long time. Quwat Ahrar al-Iraq is also officially affiliated with the Hashd Sha'abi Commission, but the brigade number is not yet known. 88th Brigade: A Sunni Hashd unit based in al-'Alam in Salah al-Din province. The leader Sheikh Wanas al-Jabara has a Sunni Sahwa background. The group was formed earlier this year with the help of Abu Mahdi al-Mohandis. 90th Brigade: Fursan al-Jubur. A Sunni Hashd unit led by MP Ahmad al-Juburi, who has been an ally of Nouri al-Maliki. Based in Ninawa province. 99th Brigade: Jaysh al-Mu'ammal. Founded by Sa'ad Sawar, who was originally a Mahdi Army commander and subsequently became involved in militia efforts in Syria. The group receives support from Iran and is another Sadrist splinter. 110th Brigade: Fayli Kurdish Badr unit, operating in Diyala. 201st Brigade: Ninawa Guards, affiliated with Utheel al-Nujaifi and linked to Turkey. The Ninawa Guards was initially not considered a part of the Hashd Sha'abi but has now attained recognition with salaries distributed for its members, despite tensions with other Hashd factions like Kata'ib Sayyid al-Shuhada'. 313th Brigade: Saraya al-Salam. Its most notable area of operations is the Samarra area. Нет, "Организация Бадр" - это одна из старейших и тесно связанных с Ираном шиитский партий и милиций, созданных КСИР. Они еще в 1980-х гг. активно участвовали ирано-иракской войне на стороне Ирана как Бригада Бадр, затем в шиитском восстании в Ираке в 1991 г. и т.д. Сейчас "Бадр" входит в правительственную коалицию и уже много лет контролирует МВД Ирака, ну и являются одним из основных получателей иранской военной помощи. Лидером "Бадра" является Хади аль-Амери, он много лет прожил в Иране и он открыто признает религиозный авторитет лидера Ирана аятоллы Хаменеи.